Everton remained unchanged from last week’s demolition of Wolves. An early injury to Jonny Heitinga meant Jack Rodwell came into the team, but the formation remained 4-2-3-1. Blackburn setup in a 4-4-1-1 with former Barcelona man Ruben Rochina playing in behind Santa Cruz with wide support from Olsson and Emerton. The first half was something of a non event. Without Hoilett Blackburn lacked any real penetration or ability to get in behind the Everton defence, shown by the fact they only registered one shot on target in the entire match. Rochina was deployed off Santa Cruz as Blackburn’s principal playmaker and had some decent touches but there was no real runners in behind our backline for him to pick a pass with – Santa Cruz is good with his back to goal but less of a threat in behind. We possessed a tad more variety in the final third with the pace of Beckford, power of Magaye and movement of Billy and Osman. The below chalkboard compares Rochina’s passing with Everton’s principal playmaker Leon Osman. Whilst Rochina had good pass completion figure (74%) which is well above his team’s average of 64%, he fails to register one successful pass into Everton’s penalty box. 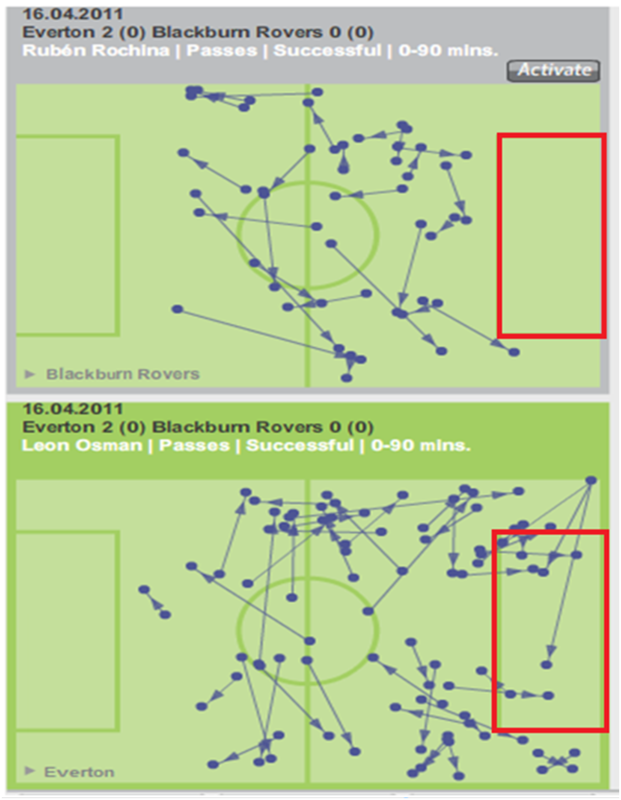 Compare this to Osman who had a pass completion of 80% (also above his teams average of 70%) but delivers more incision, with 7 of his passes penetrating the Blackburn penalty box. Osman’s goal topped of a great all-round performance as the diminutive schemer again took the plaudits for a stand out display. The Blues showed more incision in the second period as Blackburn began to fade, fitting in with the belief that Rovers are something of a first half team (before the game based on 1st half results they would have been in a Champions League spot). The % of Blackburn’s overall passes made in Everton’s final third dropped 10% in the second period from 32% to 22% as their forwards looked increasingly isolated with their defensive line dropping as the second period continued. Everton’s second goal was an example of this, as Leighton Baines was able to run 60 yards without being challenged. The full back then rolled the ball into the Blackburn box for Osman to tee up Coleman, who was rashly taken out by Phil Jones. It was a leggy challenge which summed up a Rovers side that had run out of steam. Another good win for the Blues who have now taken 17 from the last 21 available points. Inspired by Osman and playing in a system which seems to suit the personell we have available at the moment, it was a fairly routine win against a Blackburn side who suffered from a below par second half display. Saturday sees us take on Blackburn with the Blues finding their usual great end of season form with 4 wins and 2 draws from our last 6 games, underpinned by solid home form at Goodison. Over the past 2 seasons, Rovers have been a solid outfit on their home turf and poor travellers. In this period they have accrued 71% of their points on their home patch and conceded on average of 2.1 goals per game on the road – only Wigan possess a worse defensive record away from home. The one notable recent exception being their clean sheet at the Emirates a few weeks back. More often than not though, they are a soft touch away from Ewood, shown last season when an Everton side bang out of form and confidence rolled them over 3-0. Blackburn Fact of the Day: Based on half time scores, Blackburn would currently be occupying a Champions League Spot. Creativity wise, Pedersen is their principal playmaker. Out of the 45 chances he has created for opponents 6 have resulted in assists, averaging a chance created every 52minutes. The speedy Hoilett has been impressive in recent weeks – the Canadian can play on either flank, but I would expect him to play right side on Saturday to accommodate Pedersen on the left. These will be the likely wide men in a 4-1-4-1 setup. 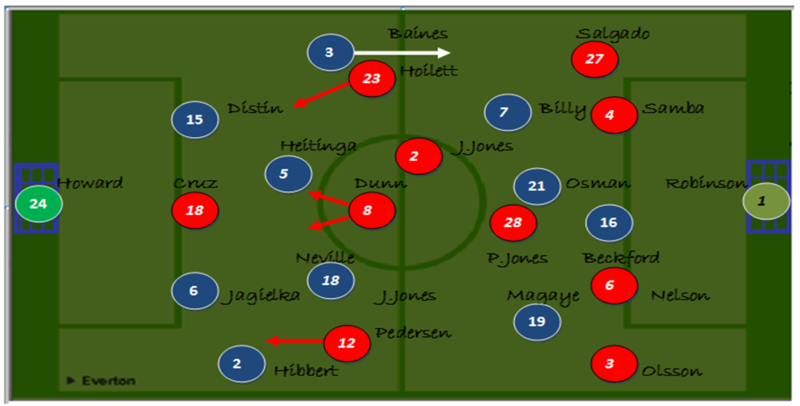 The other midfield berths are likely to be filled by Jermaine Jones, Emerton & the more creative David Dunn. Phil Jones has been allotted to midfield in the above tactics board but with Nelson today being ruled out for the season its likely he will be deployed at centre back. Up front, Kalinic, the match winner in the reverse fixture, is their most prolific forward having registered 5 goals this campaign, averaging a shot on target every 102 mins. He is currently out of favour though, with Santa Cruz likely to start as the lone striker. The Paraguayan International has failed to score in 467 minutes of football but has a good goal scoring record at Goodison Park . The Blues have non of their big hitters due to return for this one so will continue with the same team which routed Wolves last time out in a 4-2-3-1 setup. This system basically means a delineation of the midfield duties into either ‘defend’ or ‘attack’, so you have 6 defenders and 4 attackers. 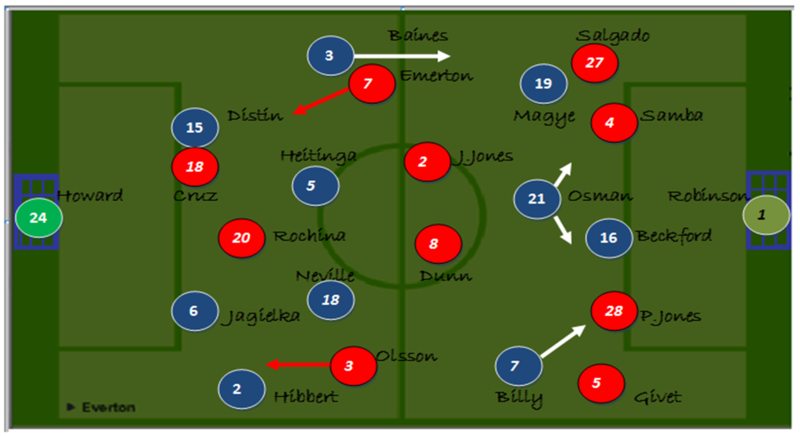 Heitinga and Neville will screen the back four and then a fluid 3 in front of them of Osman, Gueye & Billy will support Beckford. Everton Fact of the Day: With Leon Osman in the side Everton’s win% this season has been 35%, without him it drops significantly to 25%. I blogged this week on Osman’s great recent run of form and the key role he has played of late, and the midfield schemer will again be central to our chances of success on Saturday. The Blues biggest win of the season last week was achieved despite recording our lowest amount of passes made/pass completion figures of the season. Our strategy is more direct than the possession based game we started the campaign with, mainly due to the personnel options, but this is not to say we are playing long balls (why would you with nobody above 6ft in your midfield/attack?!). We are just getting the ball forward into the striker’s feet a lot more rapidly than we have been doing and playing more counter attack approach. As mentioned earlier, Rovers will try to get us to play down the flanks to cross the ball into the box where they have an aerial advantage. It’s important we show patience and stick to our own game and keep the ball on the ground, be patient and try to bring Rovers onto us and then hit them on the break. The only issue here is that whilst Wolves attacked us from the off last week leaving massive gaps in behind their high defensive line, Blackburn won’t be so adventurous, and thus we will need to be patient. This will be a tough match up for the Blues and its important we stick to our game plan and don’t get influenced by Rovers physicality. If we can do this I’m confident the goals will come. 2-0 Toffees.